Back in the winter of 2007-08, a young Skrtel was anticipating one of the most important decisions of his career. He had just turned 24, and a host of clubs were looking to prise him away from Zenit Saint Petersburg. Brows furrowed, a lot was going through the young defender’s mind. A decision had to be made. There were a lot of interested parties in obtaining his services. He chose Liverpool FC. Rafa Benitez, the then Liverpool coach had been looking for a commanding defender, who could take over the reins, once the legendary Carragher, decided to hang up his boots. He had made an impression on the young Slovak and for 6.5 Million British Pounds, he was brought to the Reds section of Merseyside. Early on this season, when the team was under scrutiny and the standard of play was below par, there was Skrtel, time and again putting in commanding displays. Individual errors at times can’t be atoned, but Skrtel, was doing whatever in his power. Running up to take corners, sliding in to make tackles, covering up for the struggling Lovren, he was the only guaranteed first team starter, in Brendan Rodgers lineup. On Sunday night at St. Mary’s against, Ronald Koeman’s Southampton, he was again outstanding. Defenders generally don’t hog the limelight when the team is doing well, but they surely get all the attention, when they make errors. 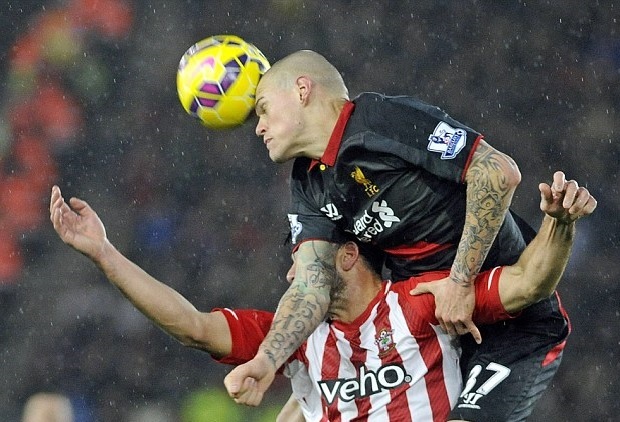 Last season, there was a constant criticism engulfing Skrtel, regarding his strong-handed tactics. He has though responded with grit and determination, which had Rodgers gushing about his leadership qualities and the way he organizes the team across the back. Such has been his influence, that Daniel Agger hasn’t been missed and Lovren has been given time to adapt as well. After a tumultuous August, last season, he gradually started putting in performances, which put to bed all doubts about his leadership qualities. As responsibilities increased, so did his performances, the bigger the occasion, the more impressive he performed. It led to Rodger’s exclaiming, “He looks a class act. It’s a big credit to him that he’s been able to prove me right. Obviously I want a certain way on the training field and in games and he didn’t feature so much in the second half of last season. As the game at St. Mary’s took off, it was the Saints who started like a train on fire. Surprisingly, the diminutive Brazilian, Phillipe Coutinho unleashed a swerving and dipping shot, which led to the Reds taking the lead against the run of play. The crowd was shocked, only seconds earlier the home team was appealing for a penalty and now they had conceded and another claim of penalty had been waived off. All of this within the first 5 minutes. Soon the match settled into a rhythm which suited the visitors more, as they preferred to let the Saints do all the attacking. Unlike the start which was a thriller, the tempo of the game slowed down to more expected lines. The crowd entertained themselves with the booing of Lovren and Lallana, while cheers were reserved for Lambert. Lallana particularly had a forgetful afternoon, and it was no surprise when he was substituted. Having taken the lead though, helped Liverpool control the game in terms of organizing. Skrtel lead the way, along with fine performances in midfield from Allen and Henderson. Early on in the season, Sterling started as a striker as a stop-gap measure due to unavailability of options. Here, though Rodgers chose to leave out Sturridge and Balotelli on the bench. Sterling though had a fitful afternoon as he filtered in and out of the game. Moreno who had replaced Markovic, then turned provider for Sterling in the 73rd minute. Sterling was there at the right place at the right time to calmly finish beyond Foster, the Southampton keeper. A season where anxiety has loomed over the Reds performances, this match marked a real turnaround with impressive performances from the defence and midfield. An adaptation to a style which complements the player’s strengths has led to Liverpool’s strong push towards the Champion’s League places. Southampton looked to attack but failed to do so with conviction, and with Skrtel dominating there was hardly any relief for Pelle. As unabatedly, the downpour continued so does the Reds bandwagon, as they finally closed out the game with another clean-sheet, their fifth consecutive away clean sheet; a first for the club in 30 years. Losing only once in the past 18 matches across all competitions has only emboldened the belief, that there is still a lot more we can expect of this team.